There’s something very intimate about waking up with a neighborhood. Especially in a place where the activities are on the outsides of houses, buildings, businesses. Whether you’re walking, running, going to get the morning paper or going to work, you’re quickly part of the early morning waterings, the bread deliveries, the sweeping of night-petals from the café patios. There are familiar people walking their old, fat dogs. Green jump-suited workers almost ready to clean the cobblestones, quietly familiar with the statues, a kave and cigarette before the tourists come with their cameras. Museum workers with bags of fresh pastries for breakfast. You pass women in early morning strolls, admiring their steady, patient paces. See a familiar hand pushing open the windows of the National Gallery. It is the time when the sun in its quietest hue, before the long heat of the day starts its rising over the crown of the Parliament, Duna like a gold-star sapphire. 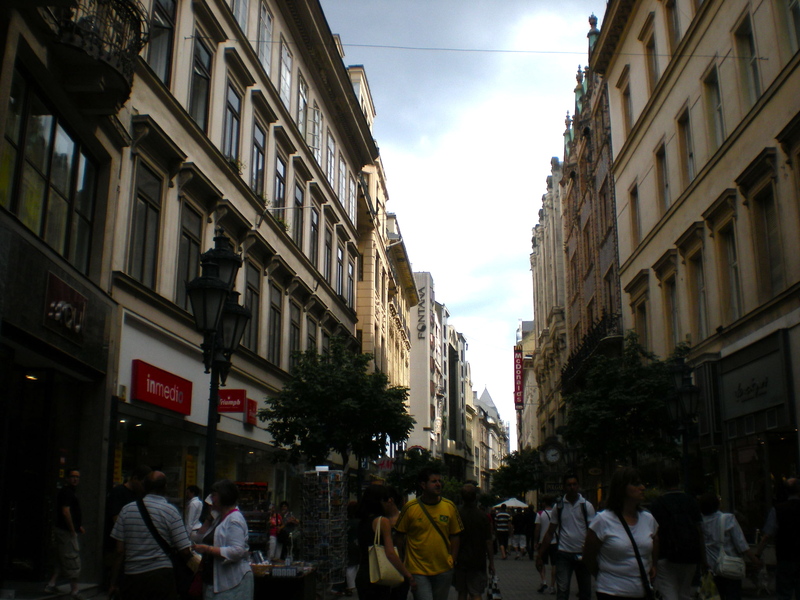 On Saturday I finally made it to Váci utca. Utca just means street, as tér means square. 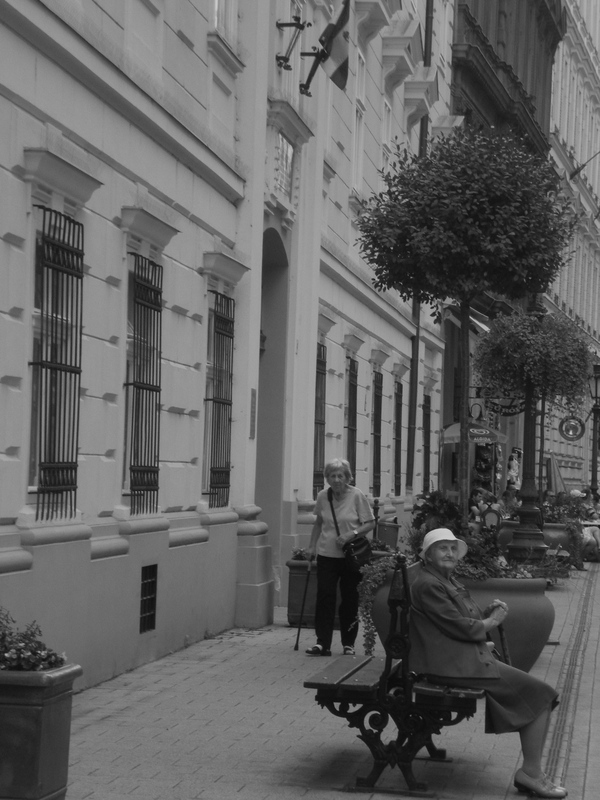 Now, Váci utca is a pretty famous street in Budapest (on the Pest side). It was two streets that were joined in the 18th century. The northern side is completely closed to car traffic and there is a pleasant mixture of 19th, 20th, and 21st century buildings, shops, stores, restaurants, banks, museums and theaters. The shopping is mostly high end with everything from European perfumeries to the finest Hungarian porcelain shops (which I have not and will not go into on account of the certainty that in one swoop I would knock over a million forints worth of ceramics and have to join the Russian circus before the summer is over). There is real history on the street and quite the crowd to take it all in. It was where Sándor Petőfi worked odd jobs, penning early lyrics for the revolution, and Franz Liszt performed at the Inn of the Seven Electors at the age of twelve. And still there is a great mix of the modern as well. At 5pm, in anticipation of the football match between Hungary and Austria, both teams’ fans took to the street to match and chant the team slogans and songs (in full disclosure, the team supporters rioted later, though in a different part of the city, and I’m glad I wasn’t there for that—apparently there were smoke bombs and batons involved—you know how European football fans can get a little nutty). Later that night, after walking about 10K during the day to and from Pest (and an early morning run), I met up with Györgyi at the local pub, Sörözgető a Vári Vitézhez, or just Pub Söröző (beer) which is about 15 steps away at the backside of my house. There are four outdoor tables, one grumpy but totally adorable waiter, Laci, who spends equal amounts of time watching football, drinking wine, and waiting on tables (when he feels like it). And while American and German accents liter the streets of the Castle District, no one speaks English or German at this place. And since I’ve been there on more than one occasion now, I know that the same people will eventually fill the tables. When the neighborhood starts to calm down, the old man with the little old dog, Nala comes out of his building across the street. He will drink half of a bottle of sparkling wine. 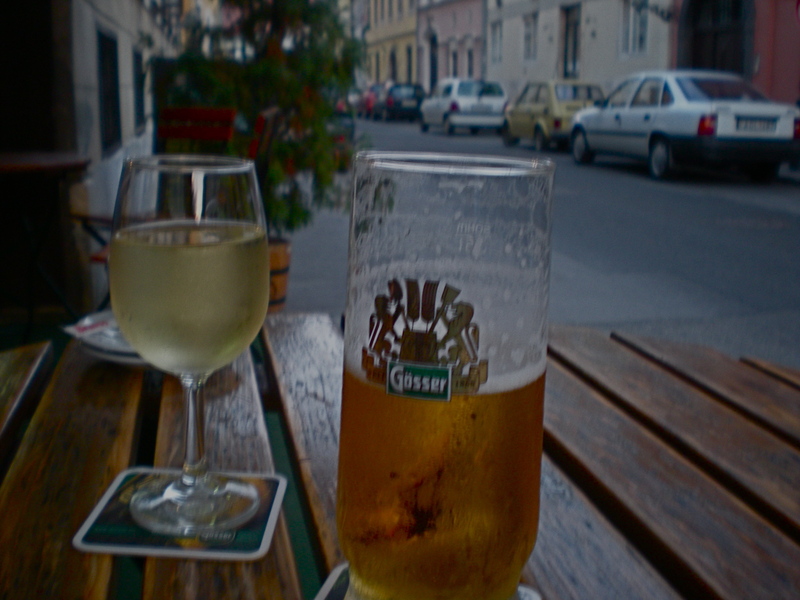 And the married couple–he drinks a tall beer, she a white wine, both a shot of pálinka. The gentleman drinking a glass of red wine gossips with Laci about a recent water polo match, calls a friend who speaks English to ask whether RELCOME is a word because he saw it on a doormat. The blonde woman in a nice summer dress with the white lab puppy who has just mustered courage to walk into the pub alone to find Laci who will secretly slip him a piece of Debreceni sausage behind the bar while his mom reads her text messages and drinks Chardonnay. And between Laci’s tales about the rigó (birds) he feeds cherries to on the tér, and the strums of the guitar lesson taking place across the street on the second floor, I will have Gösser, Dreher, or a cappuccino. It doesn’t really matter. You wake up with the neighborhood here and you set with it too, all the while a lengthening stitch in that rolling canvas. Beautifully written dear. I just know that this is the beginning of a beautiful book of poems or fiction. Which? Jessica- I just can’t stop reading your journal. You just have me mesmerized with your writing. Saw all the pictures too, so did grandma. Wow is all that I can say. Just beautiful Jewell. You perfectly capture that special place of being part of something, but just a little outside of it. Lovely. Thank you Amy, and for reading. It makes the–little outside of it–that much warmer. I miss you!! !